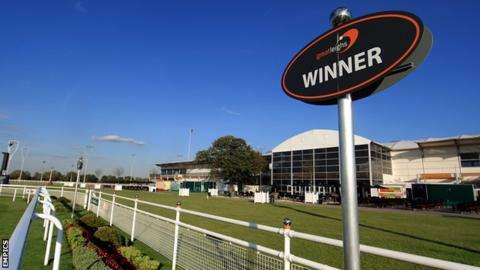 The British Horseracing Authority will assess Chelmsford City Racecourse's application to host fixtures in 2015. The track, formerly known as Great Leighs, has failed in two previous attempts to be included on the UK's flat calendar. The BHA board will meet on Wednesday and begin the process of assessing the bid from the Essex course. Since the closure of Folkestone and Hereford in 2012, there have been 59 racecourses operating in the UK. The vast majority are in England, while there are five courses in Scotland (Ayr, Hamilton Park, Kelso, Musselburgh and Perth) and three in Wales (Bangor-on-Dee, Chepstow and Ffos Las). An application from Newcastle to turn their flat track into an all-weather surface is also being considered. The Arena Racing-owned course wants to incorporate the only floodlit straight mile in the world into its all-weather plans. Chelmsford started life as Great Leighs when it opened in April 2008 to become the UK's first new racing venue since 1927, having since ceded that tag to Welsh track Ffos Las. But it lasted only nine months, before going into administration in January 2009, and has had applications in 2012 and 2013 to host fixtures rejected. But the all-weather Polytrack circuit, based near Braintree, 10 miles to the north of Chelmsford, remains in decent condition and, under the new management of Tote Media Limited, intends to focus upon the construction of a grandstand as well as leisure and betting facilities. The BHA will now consider both bids and may request further information from the courses. Should Chelmsford be successful, they will be entered into the allocation process for 2015 fixtures, although this does not guarantee dates on the calendar.